Grammy award winning singer, songwriter, poet, and actress, Chrisette Michele, is naturally curly... again! The industry mogul has Big Chopped for the third time and looks stunning and all the more confident. In an exclusive interview, she reveals all, and the best part is that she answers YOUR questions! There’s a beauty that lives so deep inside each of us. There’s a fickle eye that doesn’t believe anything it sees. There’s a benefit in love that erases all doubt and believes good intentions. There’s an ear that isn’t free enough to give the honest man the benefit of the doubt cluttered by lies not-mentioned. Since when is creativity subject to criticism? When is honesty subject to a jury of fears who wouldn’t believe rain if it fell, or sun if it shined? Sometimes a flower grows when no ones watching. Sometimes a bird sings and no one hears. There’s a meadow no one runs on and a cloud no one names. And what would the sky be with out the sun? What would the earth be with out its rose? They’d still be the sky and the Earth. So perhaps there is a peace in becoming. Perhaps the meaning is in the experience and not the sight. Maybe a flower grows because it suffocates under ground. Whether or not she is always noticed, beauty must become. She doesn’t look for an eye. She doesn’t listen for a voice. CN: What's your hair story? Also, you were natural early in your career, right? Why did you decide to straighten? Chrisette: My hair story is one of a very healthy relationship. Although I was always changing my hair from relaxed, to braided to red to natural, no matter the style it was always healthy. I made sure to give a rest when needed and loved to nurture it. My dad would relax my hair or I’d go with my mom to the salon about once a week. She always made sure I looked fabulous for church on Sundays. I was her princess. Yes I was natural early in my career. Honestly I’m not really sure why I changed it again. I just wanted to try something new and fun. I had my hair like that many times but I’m very open minded and I love change. I think my look at that time helped me to convey the sound that I wanted to portray. CN: Did you have a transition period? If so, how did you wear your hair during this time? Chrisette: This being my third BC, I already knew what I’d look like so I didn’t feel a need to transition very long because I wasn’t afraid of not having much hair. Actually before my latest BC I’d have to say my hair was probably more damaged then it had ever been. That was a result of over processing and far too much styling day after day for tours, and different types of shoots and appearances. CN: After the BC, what were your thoughts and feelings? Chrisette: I was so proud of my hair. I was even more proud of my heart and courage. In an effort to take my life back from the rigors of my career, the BC was my first step in a new healthier regimen that I’ve been wanting to adopt for a while now beginning with the head and then down. My natural hair is a symbol of a promise to myself to be kinder to myself. CN: What or who inspired you to go natural again? Was it a spontaneous decision or a process? Chrisette: I have the most incredibly beautiful mother and she BC’s all the time (our hair grows fast). She looked gorgeous upon her last BC and I felt like that was my next step towards feeling good about the way I treat my body. Also my cousins Christine and Alecia and their lovely mother Ginger and even many of my aunts have natural tresses. I feel like we are all each others twin now! I LOVE sitting next to my mom and having the same hair as her. I’d been thinking about doing this for about a year. I was often told that fashion and kinks don’t mix well together. I was often discouraged with the thinking that perhaps my music would have to change for me to pull this look off. I believe that if this is what my heart is saying then my music which is from my heart will match just perfectly. CN: How have your family and close friends reacted to your decision? Are they complimentary? Chrisette: Everyone loves my hair. My band, New Genisis, who has become my family and crew came with me to the barber and they cheered like I won a million bucks! I only stick around people who are positive. No one in my circle would say anything negative about a decision they know I trust in. My dad told me I’m beautiful no matter what I do. He’s so fly. He was so excited about the new earnings I had to go shopping for. He loves fashion. CN: How do you feel the industry will react? Are you concerned about how music executives, your fans, or the media will view your natural hair? 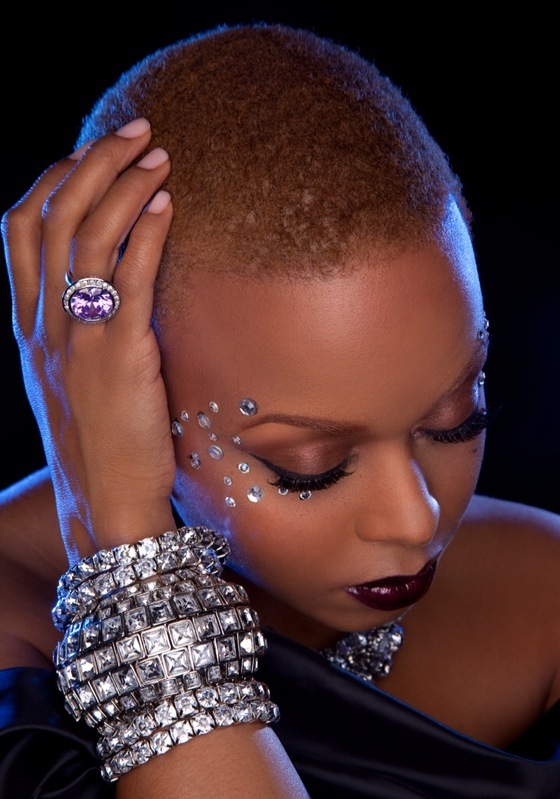 Chrisette: L.A. Reid and Def Jam have been extremely supportive of my creativity. This is the way my hair was when they signed me. When my mother asked an executive what she thought of one of the pictures she said “I don’t know why she changed it in the first place.” That was comforting to know. Truthfully however, I must say, that I’m not very good at hearing things I don’t want to hear. My ears sort of turn off when someone tells me that what my heart is saying isn’t a good idea. Truth is, I cut my hair for freedom not for beauty. CN: How do you plan to rock this newly natural fade? Hats, weaves, wigs? What are your length goals? Chrisette: I have all these cute lil vintage head pieces I’ll play with, I have tons of head bands I’ve been collecting. The band came over after the barber shop visit and helped me dye it blonde. I’m not sure if that’s a healthy option. I may keep it my natural color if this shade is too harsh for my hair. I want a big bunch of hair on my head, just wild like it used to be. I really enjoyed that. I plan to grow my natural hair for a long time. CN: What do you think of the pressure you will inevitably experience from the industry to return to a straight style? How do you plan to deal with it? We all experience this struggle in our daily lives, but we are not in an international spotlight the way you are! Chrisette: God hasn’t given us the spirit of fear but sometimes our flesh fights our heart. Every once in a while I’m afraid in my natural body even though my spirit knows precisely what it wants to do. I can never let what any one says shake me into being something I’m not. I have to be brave. Every TV stage I walk on, I shake. Every controversial interview I do, I shake. Every time I change anything, including my hair, I shake. My record label knows me. I speak softly but, I don’t lie. When I know what I want I say it. My shaven head is my way of saying “I wont take no for an answer”, it is my way of saying “I believe in my creativity and artistry”. This is how I’ve chosen to express myself and guess what? I’m shaking. But that’s okay with me because I’m conquering my fears and living out of the box. CN: Great skincare and makeup serve to enhance a BC to its fullest beauty potential. Obviously you've got that routine on lock! Please share some of your skin tips with us...what's your favorite cleanser, moisturizer, brand of makeup? Chrisette: I will say that traveling and performing nightly poses a great challenge for skincare. With the amount of time spent in stage make-up, I have to do deep cleansing treatments weekly with mud masks that pull out impurities. I also use sugar scrubs mixed with oils as my skin is dry and does better with sugar than with more abrasive scrubs like almond shells. Honey and oatmeal are good too. I always use a toner after washing my face and unfortunately I'm seen by a facialist once a month for deep cleansing. I despise extractions so I always pray I don't need any, but there are times where I'm so clogged I actually need them and my face feels lighter after. Most of my extractions are clogged pores but not pimples. I'm a moisture girl. I moisturize nightly with a balm and daily with an SPF. I'm serious about my vitamin C and E everyday under my cream for prevention and it keeps my skin from looking sallow for some reason. I'm an ivory girl at heart. I like to be clean and pretty natural. My diva takes over on stage and for appearances, and can be a little dramatic at times but if you see me on the street, my face is probably going to be pretty bare. CN:Will your future music reflect your decision to BC? Meaning will your next album be more of the true Chrisette and less of what the industry wants you to put out? Chrisette: You’ve never heard from me anything that I wasn’t comfortable with. I feel insulted when people ask me if the “industry” asked me to do something, especially when it came from my heart. I work very hard to stay honest. Nevertheless, this album will likely sound very bold. I’ll be working closely with my own writing and production team. I think you will all feel a sense of control and focus that you haven’t heard from me before. I’ve learned alot about myself and I believe I finally know what I want to share about my own personal life. I’m not afraid to share my story anymore. CN: Will you be trusting your coils to someone, or will you be handling haircare yourself.....& if so, what products have you used or would like to try? Chrisette: HA!!!!! The excitement of all of this is the fact that I’ll be doing my own hair most of the time! I plan to do flat twists and two strands twists in the future but oooh girl I’m excited to be underneath the loving, caring, styling of my own ten nurturing fingertips! CN: Who are your natural inspirations? Chrisette: My mother and her sisters and my darling cousins as I mentioned earlier. Kelis and Solange have been my most recent inspirations as they are highly fashionable and natural. Tracy Ellis Ross is such a lovely diva. India, my sister, has been such an inspiration in her boldness and courageous manner. Lastly my bff and gospel singer Danielle Lewis. CN: What would you tell someone toying with the idea of transitioning or Big Chopping? Chrisette: Do what’s best for you. What is your heart saying? Follow it. We are incredibly beautiful, us curly girls. Let’s be proud and supportive of each other. To be quite honest I’d have to say...are you ready for what I’m about to say? Ok... Don’t be one of those girls out there who have our beautiful curls but wear no smile, head is down, ain’t got no presence! Give it! Cat walk down the street! Rock that hair with the fiercest of outfits. This is not just a spiritual journey, it’s an incredible fashion statement that not everyone can wear! Treat it like a manicure or a new Prada bag and be the most amazing diva on your block. This beauty is fierce and it’s ours naturally! Let’s make each other proud! Amen?! CN: What was the attitude surrounding women and hair in your family when you were younger, and how did that affect you as you transitioned into the music scene? Also, to what extent do you feel that returning to your roots will effect the way women are viewed in the music industry? Chrisette: Well in the church I was raised in the women were VERY feminine. Their hair was a big part of their person. I was groomed to be lady like and quite girly. I think that I’m always aware of my poise and diction because of that up-bringing. Put together. Sharp. Much of my life, I must say, is an experiment. My mom is the planner. I’m free spirited. I try to think long and hard about things but my ADD tends to act up. I wonder if R&B music will be affected by my hair. I wonder if I can change the ridiculous image that plagues our community. I despise the fact that if you aren’t wearing a certain outfit and a certain cut, you aren’t cool. I am in the business of tearing down barriers. I did it with the stereotype that thick girls couldn’t be fashionable. With my latest album debuting at #1 I realized that people were comfortable with my presentation. Now I will make sure my hair is just as accepted. This is my heart you see. This is self expression. This is me. CN: How did you hear about CurlyNikki.com?! Chrisette: Can you believe I was referred to CurlyNikki.com while tweeting my twit-fam about where to go for super kewl natural styles and and hair care? CN: Anything else you'd like to add? Chrisette: I am so grateful for the bold acceptance I’ve received from my sisters. I think together we are breaking down barriers in the main stream and I’m excited about our journey ahead. There is a new integrity and honesty that we are experiencing that says “Take us as we are, or don’t take us at all”. There is a new pride rising from our community reminiscent of the times when we knew each others poetry, and held our fists in the air. We are going to support each others new business ventures, we are going to see each other in graduate schools, we will see each other in government and we will lift each other out of this depression. It starts in the heart and I pray I’ve inspired many of my sisters to follow theirs. ***See the exclusive video footage of Chrisette cutting her hair at thisischrisettemichele.com! Check out Chrisette's interview on Afrobella.com! In the comments section below, leave tips and recommendations that you feel may help make this third journey easier for Chrisette! congrats michelle! dont be scared to drop by the forum to keep us updated on ur journey and PRODUCTS!!! EEEK, the PJ in me said that. Congrats. It is nice to see someone in the entertainment business finally be themself. Keep up the good work and trust me you wont ever regret this decision. She looks gorgeous. My favorite is that third picture. No need for make up here! So happy that the circle of natural friends keeps expanding! Oh my question' been ask??? Thank You Nikki.... Oh and She looks so beautiful. OMG! Chrisette I've been a fan from day one. You are my hero, and I love, love, love your new cut. It shows those gorgeous features, wear it proud! OMG! She is even mroe freaking beautiful!!! Go Chrisette!!! she is rocking that BC! chrisette i love your music. "best of me" is one of my favorite songs EVER. your voice is definitely a beautiful, highly trained musical instrument. thanks for sharing your hairstory. welcome back to the fam. i can totally relate to chronically BCing:) all the best! LOVE her and LOVE the interview. I can't wait to see the styles she come up with as her hair grows. Great interview Nikki!! Luv ya Chrisette & you are absolutely stunning with your new cut! YaY for another Natural Hair Beauty! Simply amazing, that's all I have to say. You've definitely motivated me to go on ahead and cut this mess off! Hey Nikki! What a great interview! It seems Chrisette already has it down pat and she's absolutely stunning! Welcome back to the natural-side. lol I look forward to seeing more of you on curlynikki.com!! She is absolutely STUNNING. Great interview!! I absolutely LOVE the statement she made where she said, "GIVE IT!" That's what I'm talkin' about! Be Fierce! Be Proud! Rock It! Wow what a great interview Nikki! I actually had the pleasure of seeing Chrisette in concert and she is so beautiful. Her story is so true and I know that I made the right decision to go natural. She said all of the things that I feel when it comes to crossing over barries. Great interview! Cool Interview, Those Pictures Are So Pretty...I Love The Third Picture, Simple Yet Gorgeous! Great interview! Love Chrisette Michele and the new do. We need more icons that are comfortable in their own skin & hair for our upcoming generations. She is so beautiful and confident. Great interview!!!!! This is a very genuine and inspiring interview. I love Chrisette and saw her perform live in Houston. She's a beautiful person on stage and it shows through this interview as well! Wonderful interview Nikki! I've always been a fan of Chrisette. She looks beautiful in her new look. She is so inspirational ad confident. She is FIERCE!!!! Such a beauty!!!!!! Luv Luv Luv Chrisette!!! loved the interview! she is an inspiration and an encouragement. i wanted to jump up and down when i heard the news! i love her music. Excellent interview, and Chrisette, all I can say is keep doing yo thang girl! You are inspiring the masses. Love her music!!! Chrisette you look marvelous!! This was an awesome interview!! I just seen her saturday and she looks even more beautiful in person. It's wonderful to see her mom & i think it was her makeup artist rocking the same style!!!! Goodness gracious Chrisette. You were beautiful before, but you're fierce now! I'm so proud to call myself a curly, and you should be too! Team Curly!!!!!!!!!! "This beauty is fierce and it’s ours naturally! Let’s make each other proud! Amen?!" AMEN! Congrats Nikki and kudos on another great interview! What a fantastic interview! Thanks for asking my question Nik and her response was words to live by! This is the best celeb interview so far! Great interview Nikki!! Chrisette looks amazing! Especially in that picture with minimal makeup. I'm glad you were able to get this interview so quickly. Keep them coming. I love her music! That's awesome. Love the new look, it soothes you well. Awesome interview. Loved reading it. Thanks! She looks beautiful, I am so happy she did it. Wonderful interview! Love her, her music and her hair! Beautiful person all around!!! Chrisette girl, you are beautiful and it's a reflection of your inward spirit and character. Stay positive!!! Chrisette you and other naturals are such an inspiration. My sister is a 34 years old and is a survivor of breast cancer and has been terrified of losing her hair during her chemo process...this website is the enlightenment she needs...I cut my hair off to support her and I am loving the freedom. Chrisette words of encouragement was needed...I Luv her music and her style. Thanks Nikki for an awesome interview and for creating an encouraging website. LUV IT!!!!!! this was so awesome, so encouraging. I LOVE HER! I loved the interview! 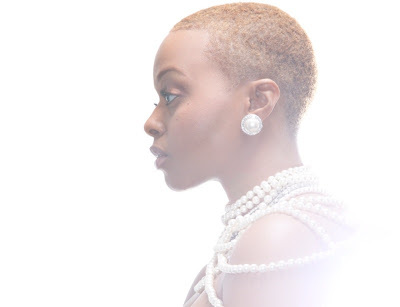 Chrisette--you are just what I expected: straight from the heart! I am a huge fan. Wonderful interview. And thank you to Chrisette. If I wasn't already natural I would be after this interview! Like many women on this site I toyed with the idea of going natural for years before I actually amassed enough courage to actually do it. I'm sure this interview made it that much easier for some woman somewhere to break away from what society and main stream media have dubbed as beautiful and become the woman she's always wanted to be! Thank you!!! Oh my gosh, she's so beautiful! Congrats Chrisette! one of the best curlynikki interviews ever!! chrisette if you're reading, i love your work. "notebook" has been in heavy rotation for me for awhile now. You look absolutely beautiful Chrisette Michelle! I know you will be an inspiration to many who want to go natural. Lovely interview. Agree, agree, agree...love the look. You're confidence has reached a higher level!!!! One suggestion, on one of your baber visits, see how you feel without getting a shape up-just embrace your natural hair line-i bet you will love it!!! I LOVE IT, I'm so happy that more and more Sister's are going NATURAL. Going natural is liberating and it allows you to be so versatile. Go Chrisette!!! Black people are so beautiful!!!! Just simply breathtaking! "When is honesty subject to a jury of fears who wouldn’t believe rain if it fell, or sun if it shined?" This line moved me. Chrisette every time I've heard you sing...I got chills all over--I'm simply moved. I'm in awe of God over your voice and it's ranges! Praises and adoration I Him for you and your voice! Congrats on your new hair transition--again! I relate to transitioning and re-transitioning, and transitioning again! Something about starting over! What an awesome interview. I got the chills! I especially love this quote "God hasn’t given us the spirit of fear but sometimes our flesh fights our heart." I love the fact that a woman of God is standing up to be who she is.Naturally.You are beautiful,naturally. And should continue to be who you are,God Bless,and stay encouraged. Best post EVER! Simply inspiring, especially about rocking your hair with fashion. I copied and pasted this, I love fashion and stopped wearing certain outfits because i didnt think style matched anymore. Thanks CM, this will be printed out and used as a my daily inspiration. Thanks for those words.. You TOTALLY ROCK your natural style. Chrisette is so amazing. She can wear a green mohawk,and it wouldn't matter. Her voice is so smooth and gorgeous. She can rock anything. Enjoyed reading this. Great interview and blog, Nikki! love it!